Artwork is such a personal choice. What floats one person’s boat isn’t always the next person’s cup of tea #whitewithoneplease. That said, I for one, love Bon’s choices of artwork in her Dream Home. True to her eclectic style she’s chosen different artists and a range styles but what they’ve all got in common is that they look amazing on those big white walls #bonniesdreamgallery. This print is an absolute #WHOPPER. It needs to be so it doesn’t get swamped by this big white wall and huge sofa. The Boys Club Room has got a boyish retro vibe to it so the vintage racing car is right at home, opposite the pinny machine. We first discovered Simon when we chose a black car doing a pink burn out for the River Shack. Another playroom wall, another retro car… are you getting Bon’s theme here? This print might look familiar. Good spotting! Bonnie used the green car from this Lauren Webster series in the River Shack reno. What better way to inject boyish cool to a room than a skateboard on the wall. The Byron Bay collective Lark Skate Co shaped the board and the clever Lauren Webster painted it. I didn’t know whether to include this awesome neon sign as art, but hey, I’m sure some aficionado once said “art is whatever you want it to be”, so that’s a good enough reason for me. It’s super-cute, it’s custom-made and it let's everyone know what to expect in this space! Hailing from the Northern Beaches of Sydney, Libby’s love of all things botanical, including palms, made her works perfect for Bon’s #moderncoastalbarn. From the simple strokes of the palm in Dodge’s room to the intense colours on the hand painted canvas in the casual dining space, Libby’s got all things tropical covered in her works. Some people are waaaaay too talented. These hands are actually reproductions of original pencil drawings but the detail is next to none. And if the kids don’t appreciate the artist’s skill I’m sure they’ll be down with the gestures. When I saw they were only $79 I nearly had an #artattack #dadjokes #sorrynotsorry Such amazing value! Proof that art really doesn’t need to blow your budget. I love how Bonnie brought the beach culture vibe to Archie’s room with these retro skater prints. The simple wooden framing and the fact that they’re different orientations add to the relaxed skater vibe. I never expected this fabulous floral print to end up in Bon’s main lounge room. This room is serenity central with neutral everything, so this print really packs a punch. It’s bloomin’ beautiful! 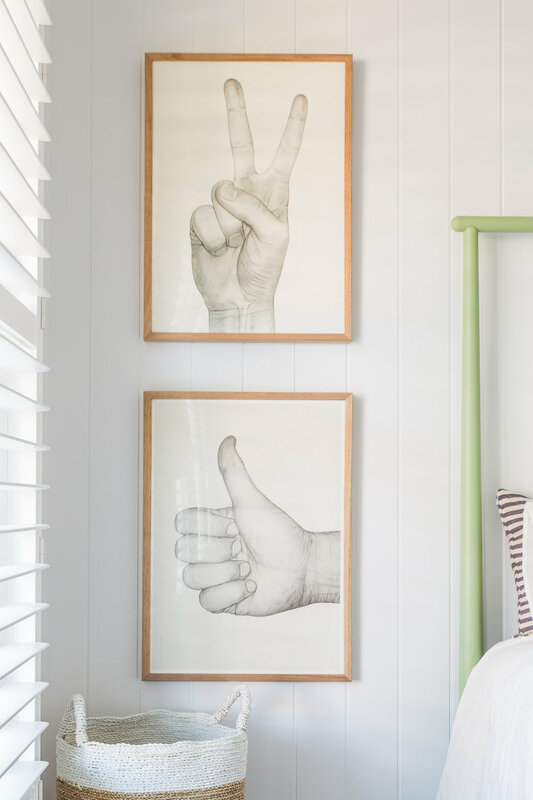 As if being a talented artist isn’t enough, the clever Jai Vasicek is also the owner of Byron Bay homewares store, Ahoy Trader. Jai’s works appear in three rooms in Bon’s home. How on earth do you choose artwork for an emerald green wall? I think Bon’s nailed it with this choice. The black elements means it complements rather than competes or contrasts with the wall colour. And the actual print, a lady in tribal headdress, is just stunning (especially up close). Palms in place of the TV? When they look this good why not? Would you ditch the TV for art? So whaddya think? Which is your favourite piece? Tell us below. SHOP THE LOOK: MY "NORTHERN BEACHES COLLECTIVE"